From the very first conversation, our team takes the time to understand your organization’s culture and your hiring manager’s individual needs. We rely on our knowledge of your business to connect you with the top industry talent within the region. We believe our team-based approach, extensive network, and sound process deliver the best results possible. Our Automotive, Engineering, Supply Chain, Operations, and Finance & Accounting search & staffing experts are the best the Midwest and Southwest regions have to offer. When you work with Ingenium Talent for your recruiting needs, you gain a partner that’s fully invested in filling your vacant positions. Like you, we value expertise, knowledge and professionalism. That’s why we’re the premier Midwest and Southeast recruiting specialists who will partner with you to find the professionals with the skills and personality you’re looking for. When you work with Ingenium Talent for your recruiting needs, you gain a partner that’s fully invested in filling your vacant positions. Like you, we value expertise, knowledge and professionalism. That’s why we’re the premier Midwest and Southeast recruiting specialists who will partner with you to find the professionals with the skills and personality you’re looking for. No matter what type of talent you’re searching for, Ingenium Talent will tailor the search to your specific needs! Our Executive level searches are conducted in a retained capacity. They are confidential, highly specialized, and conducted on a national scale so you get the best fit and most qualified talent. 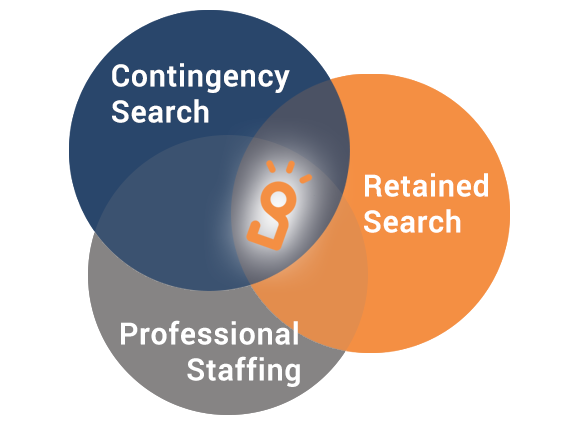 Our Executive Search Consultants have a deep understanding of the industries we service and are able to give you access to a network of passive talent that is unparalleled in the region. We ascertain how a candidate’s experience and skills align with your position and company culture ensuring you make the right hire for the long term. We conduct the majority of our mid- to senior-level placements on a contingency basis. Meaning you pay nothing unless you hire one of the candidates we introduce you to. We use our thorough understanding of our service areas and strategic partnerships to align businesses and candidates with one another in a timely manner. We pride ourselves on cultivating deep-rooted relationships throughout the Midwest and Southeast and have unparalleled access to talent in those regions. Also known as contract, consulting, contract-to-hire, and project-related needs. We also specialize in the sourcing, screening, and placement of skilled professionals, with a focus in automotive, engineering, supply chain, operations, and finance & accounting. You can always rely on us to strengthen your team.